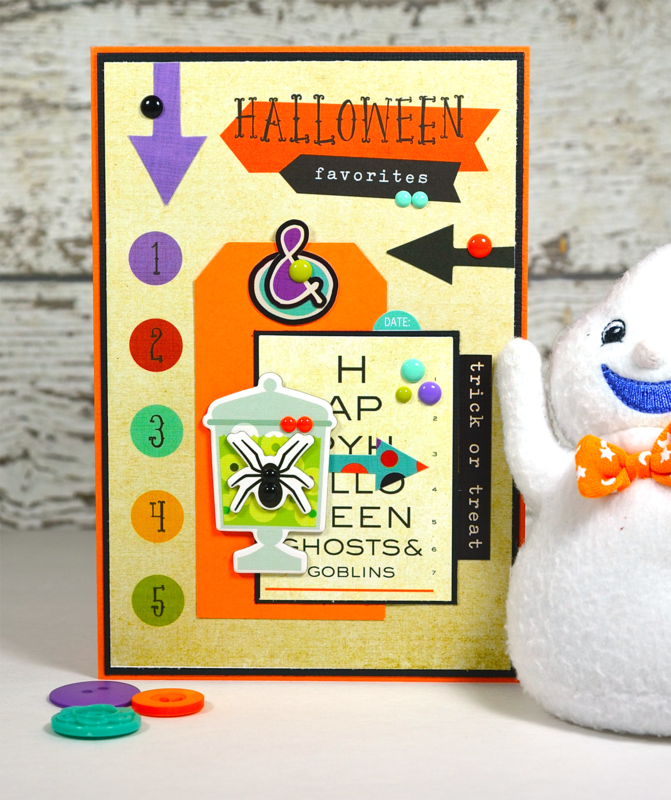 Last week I shared a Halloween card made with Simple Stories Frankie and Friends collection and promised to show you one more this week. Well, here it is! Both cards use the same type of embellishments layered on a 4x6 journaling spot — chipboard, stickers, die cuts and enamel dots — but have a completely different look. I hope you had a great Halloween and didn't overindulge in candy. I like to get the stuff out of the house as quickly as possible so I'm not tempted to eat it. Thankfully Alexa likes to bring her loot to school and dance to share with her friends. Sadly .. Brookie brings it HOME ... so I have to large bowlfuls on the kitchen counter!! The M&M's keep calling me ... and I am trying to stay strong! LOL!! I loveeee your card!! LOVING the colors and the numbers!!!!!! You are totally rockin' the cards. I love them!!! I have to opposite problem with candy. I bought 2 huge bags and had only 2 trick or treaters. Argghhh!!! What a bright, happy card! Love this not-so-spooky Halloween card, and the add of purple and teal too ! Adorable card! Trying to be good and not eat the candy! Will power!!! Love this fun Halloween card, Lisa! So cute!! I am working from the past to the present to catch up on all your awesome creations!! I sure hope I can do them all justice with a comment as cool as your projects are!! This Halloween card is so clever the way you have used the journaling card - and just added the perfect accents!! And, once again, I am thoroughly pleased with your amazing and perfect placement of enamel dots!! One of my weaknesses and fears is placing those dots - weird I know!! But if I had your innate style then maybe I wouldn't freeze at the challenge!! You amaze me both with your loads of talent but also with the loads of love you have in your heart for others!! Have a wonderful day! !